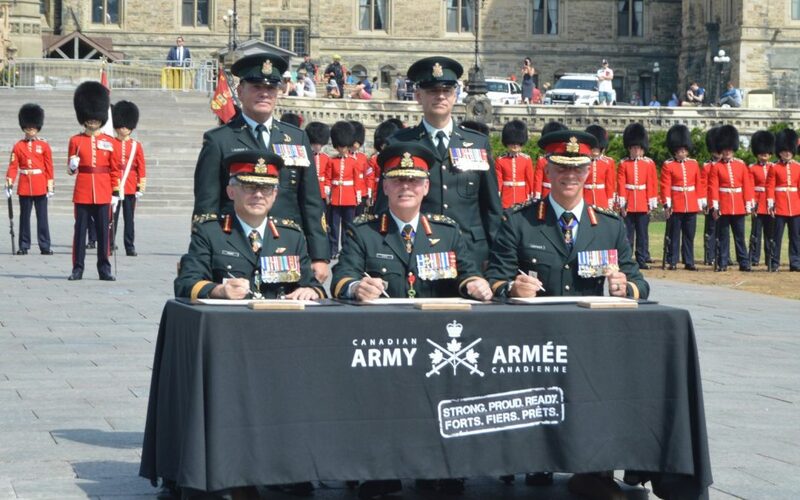 “There has been no greater privilege or honour for me than to serve as you commander.” With those final words, LGen Paul Wynnyk transferred command of the Canadian Army to LGen Jean-Marc Lanthier during a ceremony on Parliament Hill July 16. Despite the hot, humid temperatures—a sharp contrast to the mid summer rain shower that greeted Wynnyk when he assumed command in July 2016—the event included the full Ceremonial Guard and band, comprised of members of the Governor General’s Foot Guards of Ottawa and the Canadian Grenadier Guards of Montreal, as well as a cannon salute. Wynnyk praised Canadian soldiers for their operational preparedness in responding to domestic forest fires, floods and ice storms—more in the past 18 months than in the previous five years, according to Gen Jonathan Vance, Chief of the Defence Staff—and international missions against Daesh in the Middle East, capacity building in Niger, training Ukrainian forces, and leading an enhanced forward presence battlegroup in Latvia. “I cannot help but reflect that my very first job in the Army was to deter against a threat that emanated from Moscow, and my last job in the Army was focused on preparing our soldiers deploying to Ukraine and Latvia to do the same over three decades later,” he said. 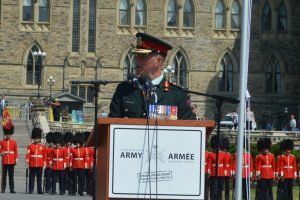 Unlike most change of command ceremonies, which are held in military facilities or museums and are largely restricted to the military and invited guests, the Army’s handover was open to the hundreds of visitors viewing Parliament Hill. Harjit Sajjan, minister of National Defence, called it a rare “opportunity to participate in an historic event for the Canadian Army” that “brings into stark relief” the values the Army holds and defends. He credited Wynnyk, who will now serve as Vice Chief of the Defence Staff, with being “a leader who always listens.” Vance, too, thanked him for his commitment and for providing “key leadership” in the lead-up to the Army’s many recent deployments. Wynnyk assured the audience there was not a more qualified officer to replace him than Lanthier. “The Army team is extremely fortunate to have a new commander who leads from the front, who cares passionately about those under his command, and who has the intellect and moral courage to guide this venerable institution,” he said. Vance noted Lanthier’s lengthy operational and command experience, including tours in the former Yugoslavia, Afghanistan and Haiti, and brigade and division commands, as well Director of Land Requirements and Chief of Programme at National Defence headquarters, responsible for the development of the government’s 2017 defence policy. “I know you are the right leader for the path that lies ahead,” he said. “I will ensure that the conditions are set to optimize [soldiers’] performance in all domains,” he said. A former commander of the Canadian Army Doctrine and Training Centre, he said more attention needs to be paid to the non-kinetic skills of information and influence activities. “We need to understand better information operations. We have to be more culturally savvy … as we go into more security capacity building missions,” he said in scrum with media after the ceremony. He also pledged to continue Wynnyk’s efforts to strengthen the Reserves—“every unit has to have an operational output and purpose,” he said—and do more to retain those in uniform. He also committed to ensure soldiers have the “right equipment, at the right time” as the Army advanced the projects outlined in the 2017 defence policy.